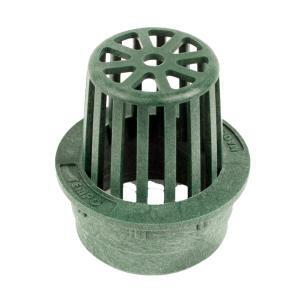 The Round Atrium Grate is a durable domed drain cover manufactured from a structurally foamed High Density Polyethylene (HDPE) with a UV inhibitor, to reduce damage from the sun, providing long life. Grate has large opening slots, designed for maximum flow, while still preventing large debris from entering the drainage system. Atrium grates are typically used for larger sized areas of flower beds that are mulched where floating debris could block a flat grate. Can be directly attached to drainage pipe where a catch basin is not necessary. Excess water flows towards and through the grate and then drains directly to below grade drainage pipe that allows the water to flow to areas where excess water can be tolerated. This style of grate is not recommended for any areas exposed to traffic. Precision engineered and manufactured to attach directly to Sewer and Drain Pipe and Fittings, Corrugated Pipe and Round Catch Basin.